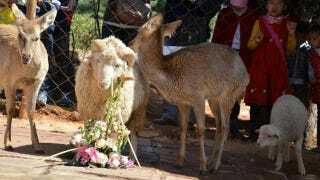 Three months or so ago, reports began to surface that a sheep and a deer were carrying on a love affair at a Chinese zoo. Well, yesterday, they "decided" to make it official, and got married in a Valentine's Day wedding ceremony at the zoo. The male sheep, who's called Long Hair, and the female deer, Pure Child, received a wedding bath and a feast of carrots and grass, which they shared with their guests (i.e., other animals from the park). There was apparently one small scare when Pure Child got nervous and left her "groom" at the altar, but the two managed eventually to find their way through the "I Do Gate" that the zoo staff had built. Oh, and if you thought this is one of those innocent animal friendships that won't be consummated, you'd be wrong. These two reportedly get it on, cross-species style. Here's hoping Pure Child and Long Hair live out their days in wedded bliss.